12-year-old “Fist Bump Kid” Liam Fitzgerald was recruited to the Men's Basketball team as both a player and coach. We are revisiting some of our favorite stories during Thanksgiving week. 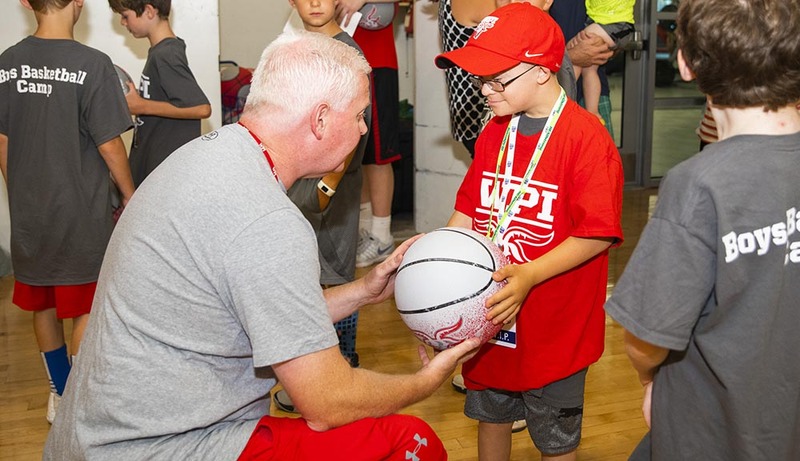 Just this year, three WPI teams partnered with Team IMPACT, a national nonprofit headquartered in Boston that connects children facing serious or chronic illnesses with college athletic teams to form lifelong bonds. If names like Keegan Concannon, Liam Fitzgerald, or Krish Vyas sound familiar, it’s probably because you saw them featured in the local media with the WPI men’s basketball, football, and baseball teams, respectively. The football team started the WPI connection to Team IMPACT several years ago and more recently “drafted” Concannon, 13, who was diagnosed with common variable immune deficiency––a rare immunodeficiency disorder. Keegan Concannon signed with WPI's football team earlier this year. The basketball team was the latest to work with Team IMPACT when it “signed” 12-year-old Fitzgerald––known as the “fist bump kid” after a video of him fist-bumping Bruins players as they left the ice went viral in 2014––as a player-coach last month. Fitzgerald was born with Down syndrome and later diagnosed with leukemia. “As coaches we all talk about mental and physical toughness to our athletes. Liam is the epitome of toughness,” says head basketball coach Chris Bartley. WPI's baseball team gathered as Krish Vyas signed his "letter of intent." The fun that Concannon, Fitzgerald, and Vyas have had cheering on their teams helps lighten an otherwise tough situation––one of the goals of Team IMPACT. While strong bonds are formed, the seriousness of the medical issues these kids face means there can be struggles and difficulties along the way. In 2016 the softball team’s Team IMPACT “signee” Kaylen Gilman, 6, passed away. The recent story of “Fist Bump Kid” Liam Fitzgerald caught the attention of more than just the WPI community. Worcester News Tonight, WBZ 4, WHDH 7, NECN, and NBC10 Boston are just a few of the local media outlets who shared Liam’s story.